I loved the Star of Light Bundle when I first saw it and it was one of the bundles I got in my original pre-order, but since then, I've been a little intimidated by it for some reason. 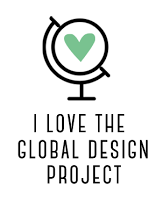 I guess I had a hard time visualizing designs with it. But I was determined to master the problem and I wanted to use it for my Technique classes this month, so I got down to work and it turned out to be easier than I thought. 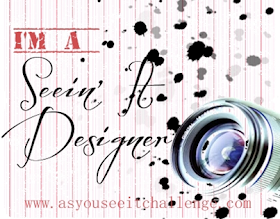 I liked the Case the Artist Challenge at Global Design Project this week! 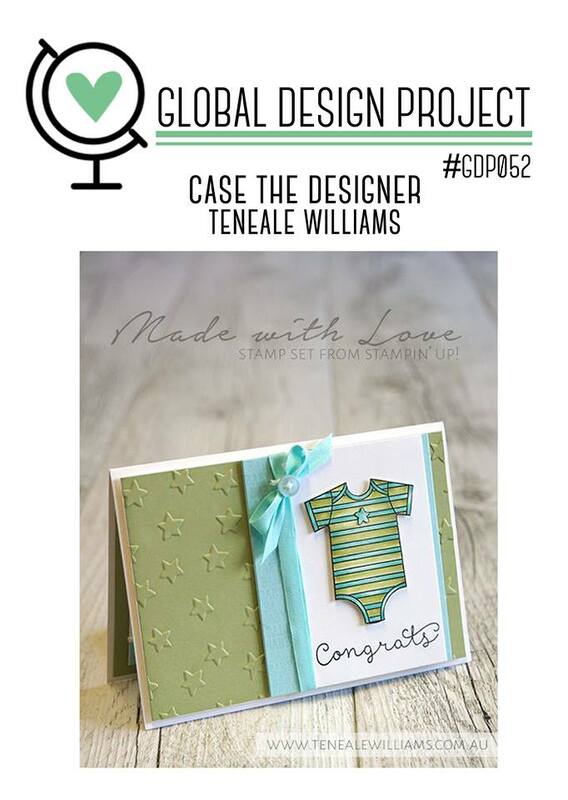 Teneale Williams is one of my favourite designers. I didn't want to use the same embossing folder as Teneale used in her design, but the Lucky Stars Embossing Folder was just so appropriate for the stamp set that I chose, that it was a no-brainer! Don't you love that swirl of stardust image from the Star of Light stamp set? 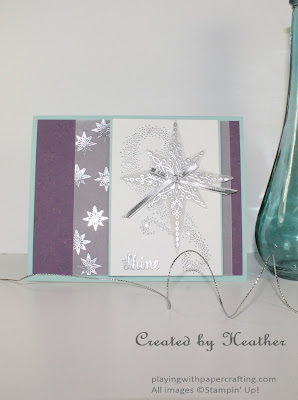 Or if you are using the star images as snowflakes, it could be a gust of wind blowing the snow! 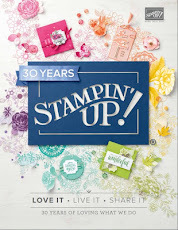 I stamped all my images using Versamark ink and heat embossed them with Silver Stampin' Emboss Powder. I love the Pool Party/Perfect Plum combination, but couldn't find a third colour that I needed for this layout. That's when I decided I could accomplish that with vellum and it works so well here. It's hard to stamp a good image on vellum, but you can heat emboss it to your heart's content and you will get perfect images! 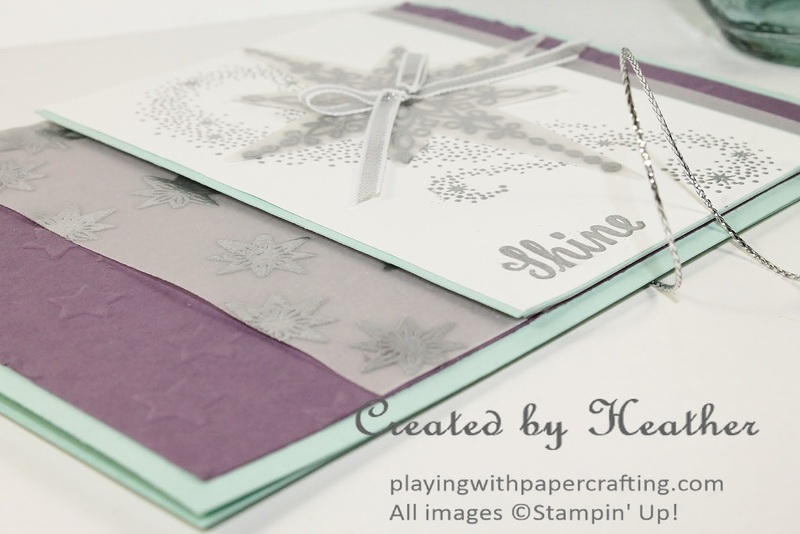 All these images you seek, plus the "Shine" sentiment are from the Star of Light stamp set. 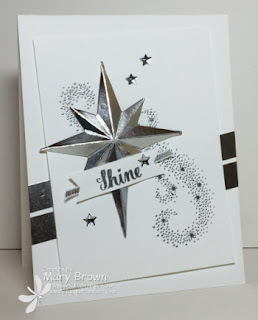 The central star image, embossed on vellum was die cut using a framelit from the Starlight Thinlits Dies, part of the bundle. 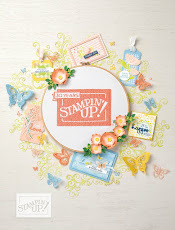 There are some beautifully intricate dies in this set, including one which cuts and scores to give you a lovely 3D star. Thanks to Mary Brown for this photo! 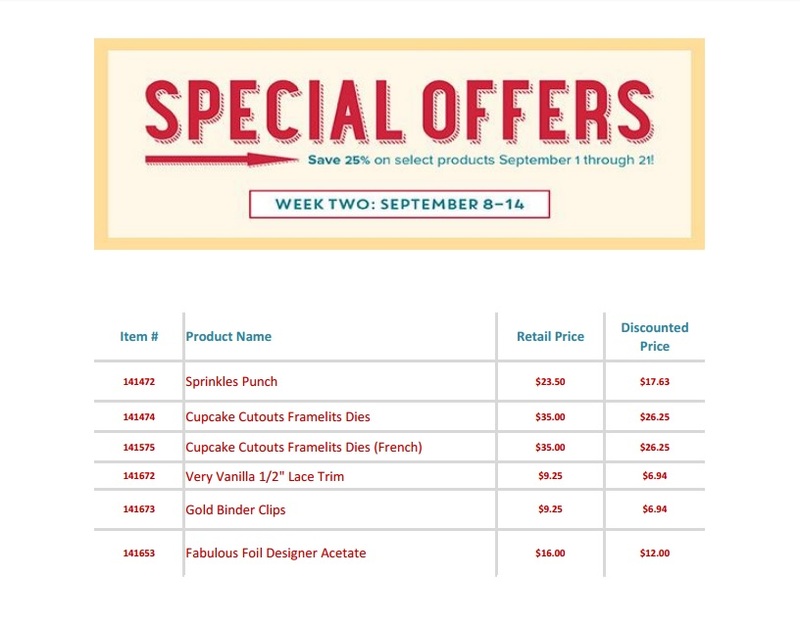 Here are the new Special Offers for the week of September 8 - 14th! 25% off these selected products! 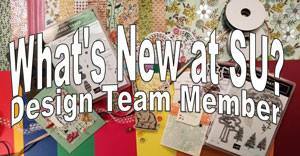 Contact me if you want anything or shop online at my On-Line Store!